The Southern California Earthquake Center (SCEC) is funded by the National Science Foundation and the U.S. Geological Survey to develop a comprehensive understanding of earthquakes in Southern California and elsewhere, and to communicate useful knowledge for reducing earthquake risk. SCEC coordinates a broad collaboration that builds across disciplines and enables a deeper understanding of system behavior than would be accessible by individual researchers or institutions working alone. At the Annual Meeting members of the community gather to share and get updates on SCEC research projects and activities, as well as plan collaborations for the coming year. Meeting Progam. 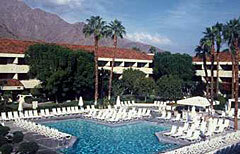 The 2006 SCEC Annual Meeting was held September 10-13 at the Hilton Palm Springs Resort in Palm Springs, California. Note: The meeting was moved to this venue from our usual meeting hotel, the Riviera Resort and Racquet Club. The Riviera was sold in March and closed on May 29 for a $300M renovation. The Hilton is about 3 km from the Riviera, in downtown Palm Springs. Due to this venue change, the meeting facilities were not as spacious as the Riviera, but the hotel was adequate for our needs. The meeting was organized by the SCEC Planning Committee, chaired by Ralph Archuleta. There were poster presentations with abstracts due no later than August 24. Abstracts were submitted on line and you can now search for abstracts below. In addition to the normal work of planning future activities, we again had several science talks during the meeting, with evenings set aside for poster sessions/viewing. The annual meeting formally started on Monday morning and concluded late Wednesday morning. Prior to the meeting, there was a one-day workshop on California 3-D Seismic Velocity Models, a meeting to discuss the Southern San Andreas Fault (SoSAFE) Project, and a viewing of the paleoseismic study site at Salt Creek -- all on Sunday, September 10. There was also a two-day pulverization workshop and field trip on Saturday and Sunday (Sept. 9-10). During the Monday night (Sept. 11) poster session, in addition to the usual posters and demos, there was a UseIT SCEC/VDO software release party. After the main meeting ended, there was a meeting on Extreme Ground Motion research results, from Wednesday afternoon through Thursday (Sept. 13-14). Meeting Abstracts and Presentations. SCEC’s long-term goal is to understand how seismic hazards change across all time scales of scientific and societal interest, from millennia to second. The collaboration emphasizes the connections between information gathering by sensor networks, fieldwork, and laboratory experiments; knowledge formulation through physics-based, system-level modeling; improved understanding of seismic hazard; and actions to reduce earthquake risk and promote resilience. Use the form below to search and view all poster and invited talk abstracts submitted to this meeting.